It's that time of year when the Brussels Sprout starts to take centre stage in the vegetable stalls of Britain. I feel a hint of guilt about the humble sprout. As a child, I hated them. I would go to extraordinary lengths to avoid eating them. I perfected the art of hiding the sprout in one cheek whilst consuming the rest of the meal. At the end, I would leave the table and run with one bulging cheek like a hamster up to the top of the house where I would retrieve the intact sprout and throw it out of the window. I can remember watching the sprout bounce down the slates of the roof before falling three stories down into the garden. Royal Navy Commanding Officer Wayne Keble OBE is in charge of the illustrious HMS Bulwark. He was allegedly heard to say that sprouts were the 'devil's vegetable' and should be banned from the Captain's table. Read one version of the full story here. Looking at the picture of the Commanding Officer in that newspaper article, he seems a reasonable man, a friendly face - not one that you would associate with an irrational fear of sprouts. I imagine it might be difficult for sprouts to sue for libel. And they are frequently the target of negative press. A few years back they were voted in a survey Britain's most hated vegetable. (Apparently they have regained some ground coming second to the aubergine this year). 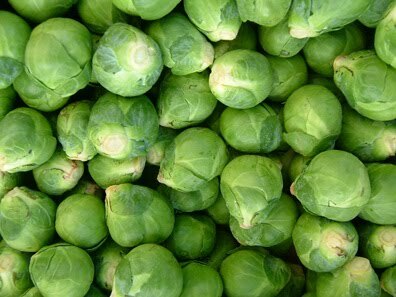 "We the undersigned, call on Commanding Officer Wayne Keble OBE, to put aside his hatred of Brussels Sprouts and to lead his men and women by example, sampling delicious recipes and dishes that demonstrate the delectable taste of sprouts. We the undersigned will also commit to supply him and his Royal Navy catering team with irresistible sprout recipes to help him on this culinary voyage of discovery". 2. And the second thing I would like you to do is to join me in putting together the most imaginative and delicious selection of your Brussels Sprouts recipes. If you are a blogger, would you agree to one day where you celebrate the sprout and feature your favourite recipe dedicated to Commanding Offiver Wayne Keble? No negative postings here please - just an attempt to encourage all sproutophobes. If you are interested in this - please leave me a comment or email me. U too was a brussel sprout "hater". Can you beleive that it was my daughter who turned me around with some delicious dishes.We had some sprouts at the Oustanding in the Field dinner at Foodbuzz in San Francisco that would turn anyone into a convert. I remember seeing a program about better ways of cooking brussels sprouts and the cook battered and deep fried them! I dont mind Brussles i only eat them on christmas. Born in Bedfordshire, we had sprouts every day for dinner. I hated them,too, with a passion. But now I am a convert, as long as they aren't stewed! Thank you so much for all these ideas. Sprouts taste so much better when you've nutured your own & watch them grow. I started roasting them 2 years ago: http://www.thecotswoldfoodyear.com/2007/12/christmas-day-most-highly-flavoured.html but stir fried with pommegranite molasses sounds good too. Or stir fried with soy sauce, or stir fried, mixed with pork & lime and wrapped in filo. ..... Might try something else. James - thank you for this. Will study your ideas and try them out - tonight we are trying Ed's. please do sign the petition ! Hi! Good to have you back Charlotte. I used to hate sprouts too until I tried this pasta dish. Yum. Peel off the outer leaves and halve 3 - 4 cups of sprouts. Toss the sprouts with 1 Tbsp olive oil, 1 tbsp balsamic vinegar, sea salt and cracked pepper. Bake for 30 - 40 minutes, taking them out every 10 minutes to stir them up so they cook evenly. Add 1/4 - 1/2 cup of walnuts for the last 10 minutes. Dice up 1 tsp of cold butter and sprinkle into the sprouts. Stir in until melted and salt / pepper to taste. I'm not a massive sprout fan in fact when I read James' comment which said "I started roasting them two years ago." It made me think maybe that's where I've been going wrong, I've not been cooking them for long enough! Ok - hit me with your best recipe Charlotte and I'll give them another try. I have two main ways of cooking them that tend to convert sprout haters to sprout lovers. My kids prefer the first option, but wil happily eat either. For either, start by trimming the sprouts, and cut a slit into the base (cut any huge ones in half). Cook in rapidly boiling salted water for about 4 minutes, then drain. Option 1: Heat 2 tsp of olive oil and about 50g of finely chopped pancetta in the pan the sprouts were cooked in. Once the fat has rendered and the pancetta is starting to crisp up, return the sprouts to the pan, cover tightly, and cook over a very low heat, tossing now and then, for 5 mins or so. Option 2: Add a large dollop of butter to the pan and melt over a medium heat. Once sizzling, add the sprouts and toss to coat with the buter. Add a generous grating of nutmeg, toss again, and then (yes, I'm a one-trick pony!) cover and cook over a low heat for 5 mins or so. Roasted with olive oil, salt and peper at high heat until the loose leaves on the outside are crispy is best. Second is thinly sliced and sauteed with onions until golden and caramelized. Maybe with a little dijon and broth added at the end to make a little sauce. Definitely not boiled until gray and stinky. That does make them the devil's vegetable! I can see that you are an expert at your field! I am launching a website soon, and your information will be very useful for me. Thanks for all your help and wishing you all the success in your business. Please come visit my site Business Trade Guide of San Jose California CA when you got time. Hi This is our recipe -perhaps you would rather have the link? Here is a recipe using Brussels sprouts which is ideal for a winter lunch or supper. We used Bridget sprouts & Woburn Country Foods black back bacon as it gave it a sweet, smoky flavour. Served with a baked potato, it was a great Sprout Supper! Great recipe. Thanks for sharing. We can have simple recipe & it is good for health. So nice to hear your voice again! In a celebration of local produce, we planted a largish suburban garden. The two largest brussel sprout plants grew, and we ate alot of brussel sprouts. I realize, though, that I need some fresh ideas, as my six year old was soundly rejecting them by the end! I have some sprouts in the veggie box this week. Need to think what to do with them - thanks for all the suggestions! Charlotte: you've been hit with some evil spammers on your board. My family LOVES roasted Brussels Sprouts, even the kids, even the picky kid. Like many other posters have said, heat the oven high (~425 to 450 deg F). If the BS are large, cut in half or quarters. If small, leave as is. Rinse, then place on a roasting pan, toss with a little olive oil (or bacon fat), salt and pepper. Some unpeeled cloves of garlic are great too (they become all soft, gooey, and mild flavoured). Roast for ~ 45 mins to an hour, until you see brown and crispy edges. When done, sprinkle with a little lemon juice or very good balsamic. You can roast a variety of veggies this way, along with the BS (e.g. tiny potatoes, quartered onions, very thick carrot batons, etc. They're all great together. Hi Charlotte - just left you a tweet. I work for organic fruit and veg people, Abel & Cole. I'm thier inhouse copy and recipe writer and I do a newsletter for a children's scheme they run for schools called Farmer's Choice. I've featured your Sprouts Petition in next week's newsletter. I'd love to get you involved in the newsletter in some way. If you're interested, send me an email: rachel.dethample@abelandcole.co.uk. Charlotte, what a great post. I laughed through your comments about the swollen cheek and rolling brussel sprouts. Me too! And now I love them. I roast them, steam them, and use them in soup. Surprisingly they are the key ingredient in my veggie soups to create a buttery flavor without the fat. I had to learn a new way of thinking about food, which author Melonie Dodaro highlights in her new book The Mind Body FX Lifestyle, which I've found fascinating. Probably wayyyyy too late, but my son (now aged 8) likes his sprouts lightly steamed and tossed with a very little sea salt and Dijon mustard; Grey Poupon for lightness of taste rather than Maille. We also like them tossed with mock beurre blanc de Vouvray (bubble any old butter, slack with slosh of white wine, reduce) to which we sometimes add chopped shallots and/or capers. Or, again, Dijon mustard, if we're in the mood for something enriched with butter. Brussels also make *fabulous* bubble-and-squeak, especially nice if you aren't vegetarian with bacon bits crisped in the pan before adding your leftover mash and previously-cooked Brussels. But we usually have to make more Brussels if we want this dish this way as we don't have leftovers. I will not comment on brussel sprouts on the grounds of "if you have nothing nice to say, say nothing at all". I do have one nice thing to say "I have an award for you, come and collect it". They are delicious, full of iron and will make you strong! Brussel sprouts are an incredible superfood. They have excellent phytonutrients and help lower blood sugar! Charlotte, I'm not sure what is going on with your site, but it is giving me a pop-up with every page asking for a Twitter log in. Which is mildly annoying, since I'm not on Twitter. In the meantime, I'm hoping you're all still enjoying Lamb & Spinach curry now and then, and perhaps other Madhur Jaffery Indian recipies. Try serving it with raita, spiced yoghert with seeded diced cucumber and diced fresh tomato. And you've worked your way through vegetables, have you thought about experimenting with grains? Polenta, homeny, pearl barley, brown rice, bulgher wheat, steel cut oats, etc? Just as you've discovered new vegetables, I expect that there are grain options and recipes that you'd have fun experimenting with. Brussels sprouts are really good . They are very good source of many essential vitamins, fiber, and folate along with their other cousins like broccoli, cabbage and cauliflower. Not brussels sprouts, but I ran across a dish that your family may like - Amish Baked Lima Beans. I had them at an Amish restaurant in Lancaster County. They're dried (not green) lima beans, baked in a sweet and (slightly) sour sauce, with bacon. Really great blog and very interesting challenge! And gladly amazon delivers books all over the world, so I will proablably be ordering this awesome book:).Thanks for this awesome blog also:). As a rich green vegetables Brussels Sprout is really very good and delicious. Your blog has captured some good pictures of Brussels Sprout. Thanks for picking up Brussels sprouts.They are very good for the health and should be consumed.These recipes will also inspire us to get vegan which is very good for health. Roasted sprouts are simply devine! especially drizzled with a little bit of organic honey first. Try it out you wont regret it! I love brussel sprouts, thanks for sharing. This is a very good tasting vegetable. Especially when you know how to cook them so you can make it more delicious than it was before. I haven't tried the roasting of brussel sprouts as suggested above but that seems interesting. I've always liked steaming them with olive oil and garlic. Simple yet delicious. I grew up on eating brussel sprouts pretty often when i was a kid on our families farm. I still think they are delicious and don't understand the whole stigma of kids never liking them. hey,these are brilliant ideas. Thanks for sharing such wonderful tips. Keep on sharing. I'm the only one in the house that likes them. I would eat them often if I could. Love them with a bit of Rice wine vinegar. I'm not good with recipes, but I love Sprouts. I will be watching for all the great new recipes. thanks for great and healthy recipe .. I love them and I eat them. I just can't get my family to eat them with me. they don't know what they are missing. This looks awesome!! I'm making hashed brussels sprouts with poppy seeds this weekend on my blog! plentylovely.blogspot.com -- I don't know why brussels sprouts have such a bad rap- if cooked right, they are delicious!